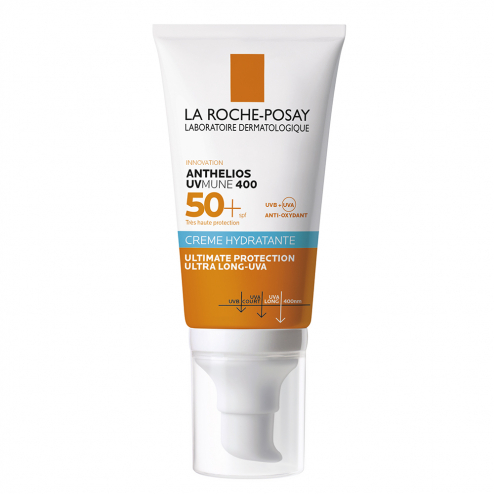 La Roche-Posay Anthelios Ultra Innovation Sensitive Eyes Cream SPF 50+ 50ml is a cream of very high protection ideal for the protection of skin sensitive to solar allergies. This cream contains an XL Protect complex: broad-spectrum technology, with proven protection against UVA / UVB and some damage caused by pollution and oxidative stress. Innovation anti-tingling sensitive eyes: the right number of ingredients, without compromising on protection. 12 ingredients less than the previous formula. It leaves no white marks or a greasy effect on the skin. Resistant to water. Dermatologically tested on sensitive and reactive skin. Ophthalmologically tested on eyes and contours of sensitive eyes. Formulated without paraben, without preservative. Apply the product just before exposure. Renew generously and frequently, especially after swimming, sweating or wiping. External use. Indication: Sun protection of SPF 50+. Aqua / Water, Diisopropyl Sebacate, Glycerin, Bis-Ethylhexyloxyphenol, Methoxyphenyl Triazine, Alcohol Denat, Propanediol, Ethylhexyl Salicylate, Ethylhexyl Triazone, C12-22 Alkyl Acrylate / Hydroxyethylacrylate Copolymer, Drometrizole Trisiloxane, Butyl Methoxydibenzoylmethane, Aluminum Starch Octenylsuccinate, Silica, Tocopherol, Isopropyl Lauroyl Sarcosinate, Copolymer Acrylates, Ammonium Acryloyldimethyltaurate / VP Copolymer, Caprylyl Glycol, Citric Acid, Disodium Edta, Scutellaria Baicalensis Extract / Scutellaria Baicalensis Root Extract, T-Butyl Alcohol, Terephthalylidene, Dicamphor Sulfonic Acid, Triethanolamine, Xanthan Gum, Fragrance / Fragrance .